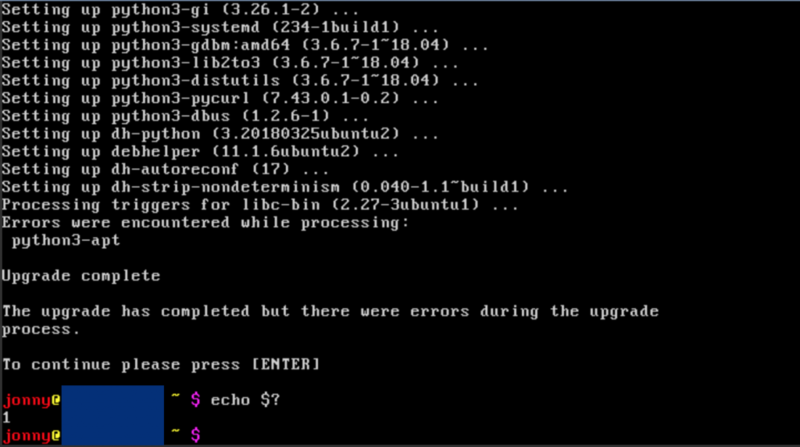 My blog runs on a VM at Hetzner with an Ubuntu LTS system. That means 5 years of support… I was running trusty from 2014, so there should be support until 2019. But not every open source software has given you this promise, just the Ubuntanians. So, support for Owncloud run out last year and I thought that the days between years are a good time to switch to a new version. Hence, I did two dist-upgrades after another from trusty to xenial and from xenial to the current LTS version bionic (every 2 years a new LTS version is coming out). The first upgrade was “successful” with a lot of need for adaption in the configurations afterwards. Then after everything worked again, I did another upgrade, which failed because of this issue. You do not want your system showing you such a message during do-release-update. That is, I had to fix a distro upgrade that failed in between… challenge accepted 🤓.